As organizations push for digital transformation, digital skills will continue to be in hot demand. One of the biggest challenges in transforming to a digital business is the skills gap that exists to execute. BrainStorm Events give practitioners like you the knowledge base and real-world skills to implement business capabilities with business architecture. Immerse yourself in the foundations of real-world business capabilities. Learn to apply the underlying concepts and principles of proven disciplines and methodologies from the leading experts in the field. 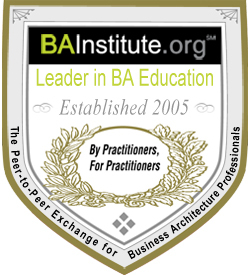 Experience unparalleled training by the leading authority in business capabilities and related training. 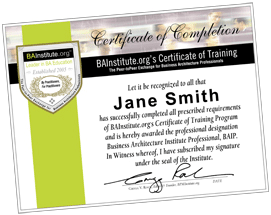 Only BAInstitute.org can provide you with a full curriculum of 30 courses and six professional certificates around business capabilities. And only we can provide our courses ondemand, live online and in person throughout the year. Our instructors are leading experts who provide you with comprehensive training that includes real world case studies and hands-on exercises. You could complete 50% of the requirements for your certificate at the next event or online via eLearning. Use our role-based Learning Paths guide to choose the courses that are right for you. Register for an event online, call to speak with a training advisor at (508) 475-0475 x15 or schedule a meeting to discuss your individual or group training needs. “I appreciated the feedback today related to each of our personal situations within our organizations and things that we have experienced in our careers. Putting it all in that real-world context really helps the material resonate and sink in."